When you mention the word Freemason to people it usually conjures up images of secret handshakes and the symbols of the square, compass and apron. I came on this tour which was organised by Hidden Spaces hoping that some of the myths surrounding this society would be dispelled. Situated in the shadows of the Mailbox is the Masonic Hall on Severn Street which is home to Athol Lodge. We were met in The Lodge Room, which is the main ceremonial space of the Hall by Tony our guide. He began by explaining about the history of the area, how it was once known as the Froggery due to it being damp and marshy. We were informed that in the 18th and 19th century it was a poor slum area populated by unsavoury types such as the Peaky Blinders. In 1809 the small Hebrew community built a synagogue at this site which originally consisted of the entrance rooms and the Lodge Room. It was sold to the members of Athol Lodge and opened as a Masonic Hall in 1858 and is the first and oldest Masonic meeting place in Birmingham. After the founding of the Jewish Lodge of Israel in 1874 the two Lodges shared the building so it was no surprise to still see evidence of its former life such as the Star of David symbol dotted around the building. There were a number of fascinating features pointed out to us in the Lodge Room such as the The Worshipful Master’s Chair which is also known as the “Kings Chair” (see the photo above) on account it had once been sat upon by Edward VII when he was still Prince of Wales and is commerated with an inscription plate bearing the words “This chair was lent to the Birmingham and Midlands Counties Agricultural Exhibition Society for the use of His Royal Highness the Prince of Wales KG, Most Worshipful Grand Master, on the occasion of his visit to the Exhibition held at Bingley Hall on November 28 1885.” This fact appeared to back up the theory that the Freemasons are a society of rich and powerful men. However our host when he was telling us about the ceiling emblazoned with stars advised that any man was welcome to join the Masons as long as they believe in a supreme being hence the G symbol which was prevalent and represented the Guardian of the Universe. So essentially if you are male and believe in some deity such as God or Allah you fit the criteria of joining. I did point out that even the Church of England allow female bishops these days! Other noteable features were the pennants hanging from the walls which represented the 36 Lodges that meet at Athol Lodge. I particularly liked the pennant of the Arts & Crafts Lodge (above) I had this image of them meeting at the Lodge and doing activities like knitting! The black and white chequerboard floor was symbolic of the duality of light and darkness and the joys and sorrows of life. Tony also showed us a pipe organ in the corner of the room which was installed in the synagogue that was formerly on this site. It is believed that the organ was played by Felix Mendelssohn during rehearsals of the 1837 and 1846 festival concerts of the Birmingham Oratorio Choral Society. 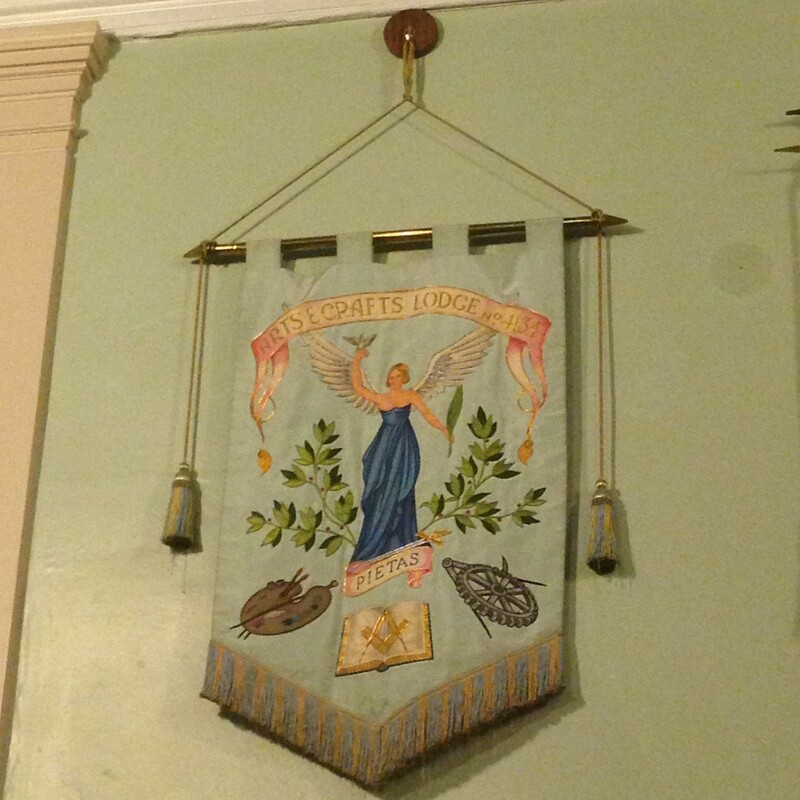 We were also given a brief history of the Freemasons of how the current form was formed in 1717 in London and is based on ancient stonemasons guilds hence the symbols such as the apron and the fact they use the Craft Masonry’s calendar. Tony went on to inform us of the history of Freemasons in Birmingham. It’s origins began in 1811 when the Army was bought in to quell disturbances caused by the Hunger Riots. Freemasons in the military were members of a Military Lodge and during their stay in the city they initiated at least six Birmingham citizens into Freemasonry and on 24th July 1811 the first meeting of the Lodge took place. They held their meetings in a number of taverns before they bought the Severn Street Synagogue in 1858 in order to become their permanent meeting place. Our guide advised that the secret handshake and stories of ceremonies involving animal sacrifices were misnomers. He stressed that Freemasonry is not a secret society but it is a society with secrets as such we weren’t privy to what really happens in meetings or initiation ceremonies. We were then led into the dining room which is used after every meeting to hold a meal or ‘festive board’. Here we were told that one of the highlights of the year is when they hold celebratory dinners and wives and partners are invited along. 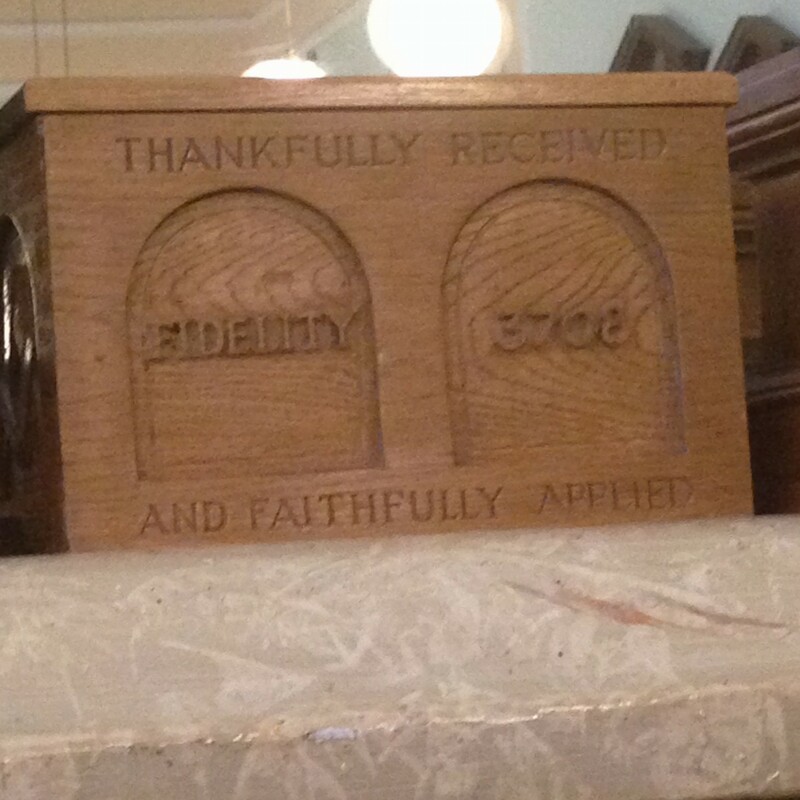 We were informed that during dinners the box pictured above is passed around for Masons to donate to charity. Tony stated that fundraising for charity is a large part of what they do but it isn’t something that the public has picked up on it it’s perception of the society. Our final point in the tour was the Tylers Room which is used as a cloakroom for Masons during their meetings and is also home to the Lodge’s museum. The Tyler is the name given to the gentleman who sits outside the meeting room with a drawn sword to keep non Masons from entering the meeting that is in session. The Hall is used for many purposes outside of Freemasonry, it can be hired out for wedddings, parties and business meetings. It even hosts a Spooky Night which includes a ghost walk round the city. 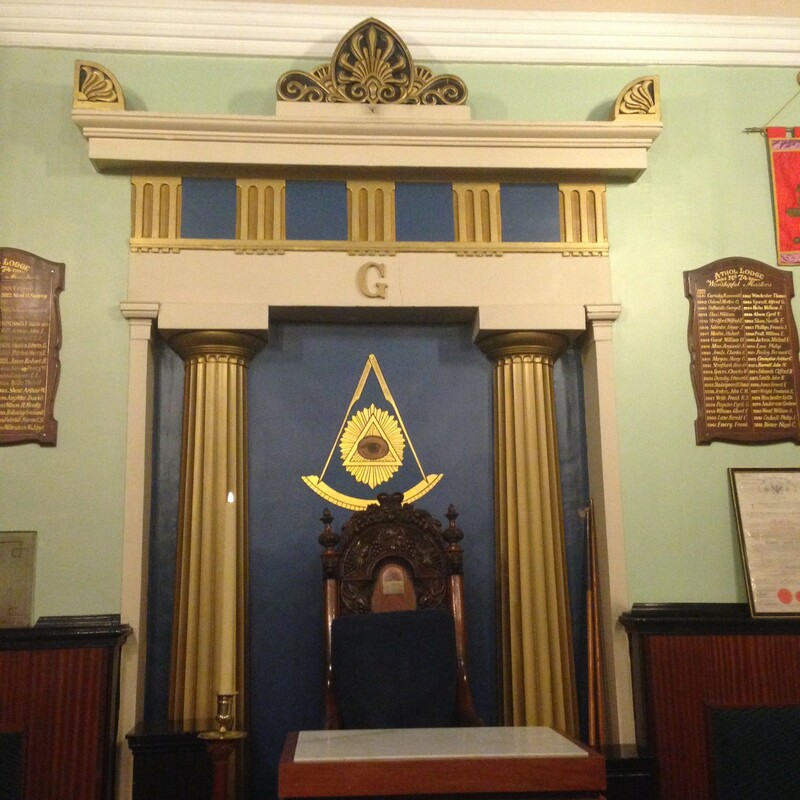 I enjoyed learning about the history of the building and of the origins of Freemasonry. I particularly liked seeing the array of Masonic artefacts and regalia that were on display. Our guide came over as friendly and knowledgeable despite the fact we never truly found out what actually goes on in there.